Turban Snails (or Turban Shells) are members of the family Turbinidae and possess a single snail-like shell. 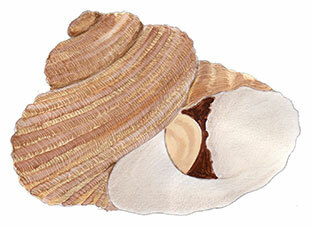 They also possess an operculum, a calcareous plate used to protect the animal when it withdraws into its shell. The operculum is smooth and round in shape. Up to 110 mm wide, 98 mm high. Turban Snails are distributed from NSW to Western Australia, including Tasmania. They are found in intertidal and shallow reef areas at depths to about 20 m. Turban Shells are benthic marine animals, which can also be found in tidal pools and weed-covered reefs. Turban Shells are also referred to as periwinkles, however the term periwinkle is also used to describe a variety of gastropod mollusc species.